After only five days, our peppers are popping up. Literally — they just show their “backs,” then up they pop. Yesterday I took some out of the plastic so the humidity wouldn’t cause them to dampen off, and put them in one of the little plastic greenhouses we use in the house. It seems every time I look at those containers behind our wood stove, more peppers are coming up. Now it feels like spring might really be coming. It’s exciting to first see their tender “backs” coming up through the soil. Then they pop upright with their two baby leaves. Here’s one of dozens of containers of pepper seedlings. Yep, it’s still cold, but not as cold as it has been. Last night it only got down to -6° F and today it’s in the teens above zero! Whew, those beavers were sure right about their winter prediction. Next week I’ll be starting tomatoes. I sorted out the different varieties and found I had nearly 100. (Don’t tell Will!) Maybe I won’t plant all of them … Ha, ha, ha — Get out Old Yeller, Honey … But I’ll let Will rest a bit first. He’s pretty pooped from all the cow-watching the last couple of weeks. 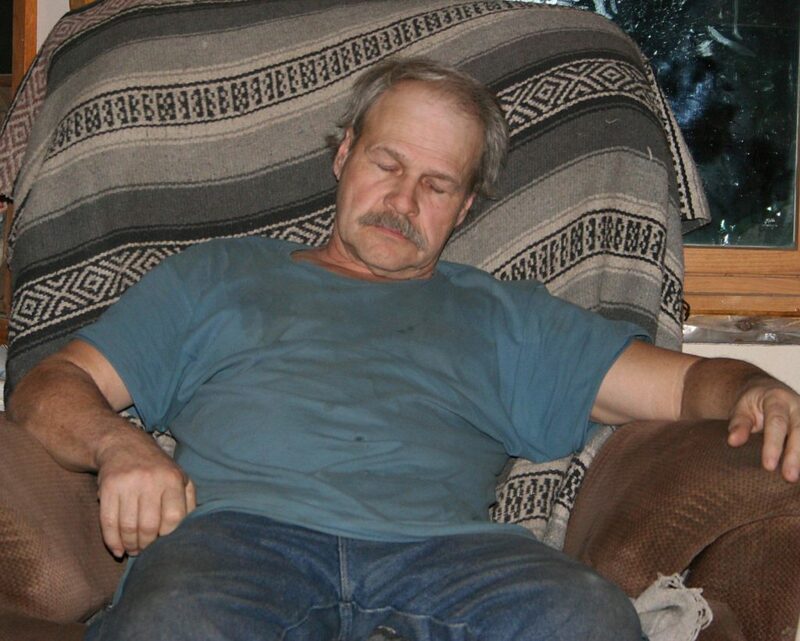 He even fell asleep in his chair in the middle of the day. Hey, it happens. Gotta love homesteading though. Will is one tired cowboy. Do you have to peel the potatoes? I’m assuming you do. I don’t like peeling the runts but hate to not use them also. Most people love little potatoes but when you are peeling potatoes for supper and in a hurry, yuck! I agree. I hate peeling little potatoes! When I can them, I do peel the potatoes but when I can up new potatoes and very small ones, I leave the peels on after scrubbing them very well. The skins sometimes are tough but you can pop the potato right out of the skin like a grape when you open a jar. I use either a quality seed starting soil such as ProMix or Jiffy pellets. Using cheaper seed starting medium is a waste of money and time. I dampen the soil or pellets with hot water then poke seed holes about the depth of the thickness of a nickel. (With smaller seeds, just press them into the soil.) Place two seeds in each hole then press the soil down around and over them. Put the whole container in a plastic bag and place in a very warm spot but NOT in a sunny window or they’ll cook. Check each day after 3 days. When you see sprouting beginning, immediately place in a very sunny window or close under a light such as a Grow Light or shop light. 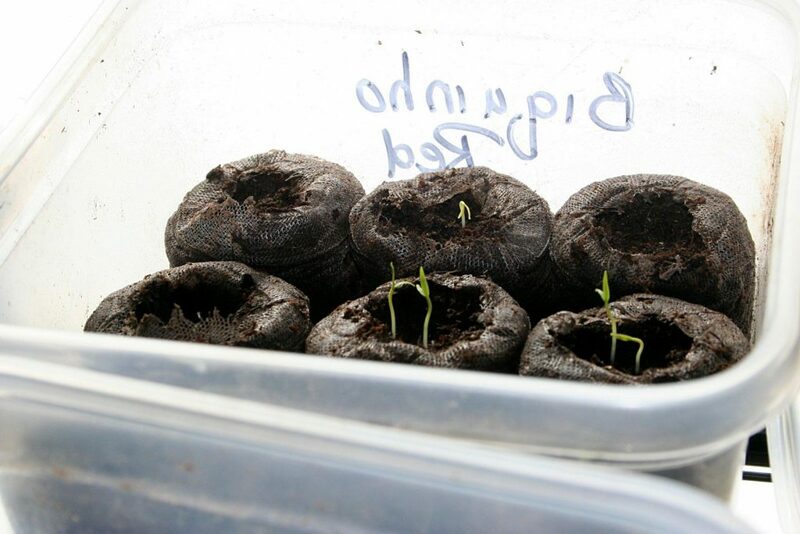 Be sure to check for dryness and water enough to keep the seedlings damp but not wet. If you don’t have a very warm spot, consider buying a seed starting mat to place under the containers. 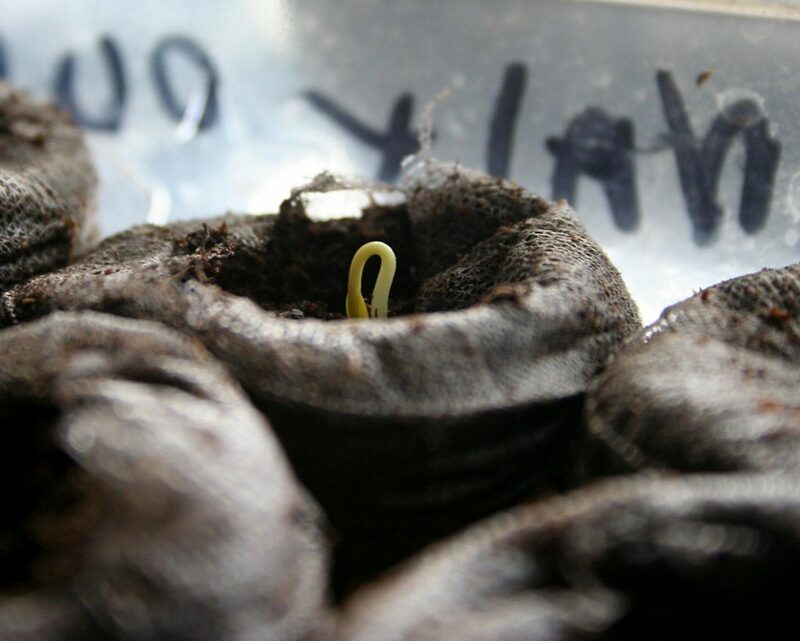 Warmth is very important to get seeds to germinate quickly and form strong seedlings. Do the frozen ones end up turning color before you get a chance to can them up? No. I just barely thaw them and then get to processing them. They stay nice and white. My peppers are popping up too, great to see. Today a wow 35 and the beginning of a melt down. Not warm enough to shut down the wood stove but I do see the day coming ? one month. When canning potatoes is there some way to avoid the cloudy liquid in the jar. It doesn’t seem to affect taste just appearance. Also when my potatoes sprout I remove the sprout and keep using them-is there any harm. Thanks for the seeds, the clear dawn onions have sprouted. No, there’s really not a way to avoid the cloudy liquid, which is potato starch, in your jars. We just live with it. I’ve found when I can up whole, unpeeled new potatoes, there isn’t any starch in the jars. No, removing the sprouts and just using them is fine. I do it all summer! Your onions beat mine but then I didn’t get to planting them as soon as I should have. Congratulations and Happy Spring! We too have snow piled up all over and COLD. But you know it’s going to rain this week so hopefully this will start the turn towards spring. Plus we are going to have 30 in central WI!!! Can’t wait to get started on mine!! Yes the beavers were right again!! They do a better job than all the weather computers!!! Jackie will you please send me a seed catalog. Ruth Ann Martin, 2307 Fairfield Ave, Kalamazoo, MI 49048. Thank you. Sure thing, Ruth Ann! Your catalog will be off to you in tomorrow morning’s mail. Happy Gardening! So many changes! Each year at this time my hubby has been down in basement starting the seeds. With him passing away 10 weeks ago today, how I wish it was happening again this year! May you enjoy this new season, Jackie! I hear you Ginger. I remember feeling the same way the spring following my husband, Bob’s death. But seasons pass as does the pain. Hang in there and breathe in spring soon. we use our canned potatoes when we want fried potatoes and onions or mashed potatoes. Even just boiled and buttered. They’re one of the handiest things in our pantry! It’s easy to make potato salad with them also. I just keep a couple quart jars in the frig, drain and mix it up. Super fast.